AN AUTOMATED screen optimiser from TTP Labtech promises to deliver the simple, reliable and fast set-up of screen plates to streamline laboratory crystallography studies. The new instrument, called the Woodpecker, is to be unveiled next week at the American Crystallographic Association (ACA) meeting in Boston, UDSA (28 July – 1 August 2012). Woodpecker offers non-contact positive displacement pipetting, which TTP says allows it to dispense fluids of a broad range of viscosities. Dispense volumes can be as low as 0.5ul, with fluids transferred directly into crystallography plates without the need for liquid classification. Optimised screen plates can therefore be set-up in less than five minutes, with zero cross-contamination, it says. The name Woodpecker follows the company’s recent trend for giving its instruments unlikely-sounding monickers from the natural world. Woodpecker joins Mosquito in the liquid handling portfolio, the latter being aimed at protein crystallography, serial dilutions, and assay miniaturisation. TTP says that the combination of the accurate nanolitre dispensing capabilities of Mosquito Crystal and the new Woodpecker means users can be confident in the accuracy and repeatability of their automated crystallisation set-up. The company also reports that it will present two posters at the ACA meeting. 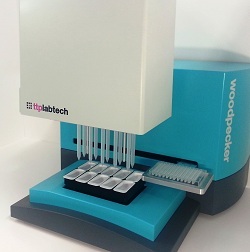 ‘Fast, simple and accurate screen optimisation with the TTP Labtech Woodpecker’ gives an introduction to the new instrument, while ‘Mosquito Crystal and Mosquito LCP: fast, reliable automation of protein crystallisation drop set-up’ outlines the capabilities of both Mosquito models.